Blogger introducing some latest features for their user.In the new blogger layout, it's post editor has this option by default, by which you can easily disable and enable comments.By this you can give your blog posts a professional look, because I have seen many professional bloggers out there who disable commenting after a certain time period! This is very easy tutorial you don't need a single piece of code here. But we're posting this tutorial beacause some people really don't know about this feature. tutorial beacause some people really don't know about this feature. If your blog gets too much spam comments. You already have much comments and don't have time to read them. It is a contact page, sitemap page, or a tool so, here you can disable the commenting option. You are away from your's blog and you don't want people to flood it with comments in your absence or you want to reply to each one of the question! Go to posts, Select the post on which you want to disable comments, and open it it in editor! There you'll see "Post Options" on the right sidebar. From here, Click options and a drop-down menu will be displayed! 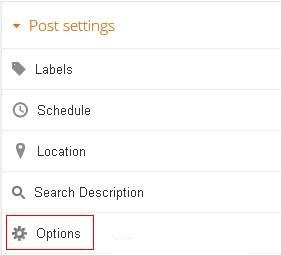 If it's an old post than you'll see: Allow - This is the default option which allows comments! Select the suitable option! and click Done! And your'e DONE! These can be some of the possible conditions! Don't allow, show existing - This option disables comments, without hiding existing comments! Allow-This is the default option which allows comments! Don't Allow-It will not show the commenting box below posts from the day first! Hope you love this tutorial.Stay with us for more such upcoming awesome tutorials.Enjoy..!!! oh it's been awhile since I visited your blog. Good to find another useful trick here! This is very helpful as it gives you back the flexibility on allowing/disallowing comments. These are very helpful tips :D Thanks for sharing! I saw this one while hovering to the widgets. Hehehehehe...so easy. Thanks a lot. Very amazing feature. This helps to create a blog more professional. I am looking for how to enable comments on one page, but disable on others. Do you know how to do that? Thanks! Just same as in blog post. is there a way i could enable the comments all at the same time on all the blog posts?